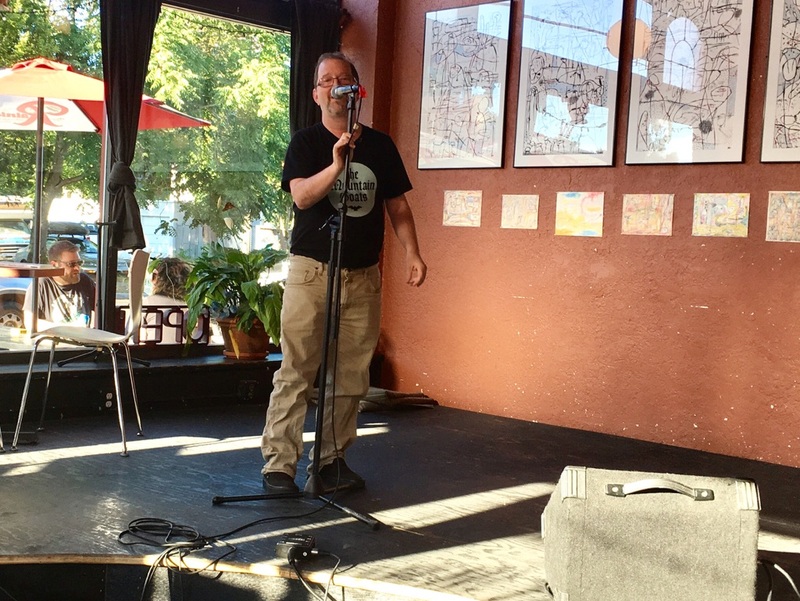 On Thursday, August 17, Allen Callaci began his late afternoon reading from his memoir “Heart Like a Starfish” as the undying summer sun engulfed the performance space of Turn, Turn, Turn. He was very much alive. His book details his heart transplant surgery, an event that brought him to death’s door. I can’t help giving the story away. When I approached Allen before the event he joked, “Spoiler alert, it turns out good at the end,” a relief, because if it hadn’t turned out good there would have been no one to write the book. I met Allen over twenty years ago, when I had the freedom and time to drive around the country and took a trip with two friends, playing music, seeing the United States and meeting people. We had a connection with the gang associated with the Shrimper cassette label. One travel companion, Will Simmons, had recordings on compilations released by Shrimper. In planning the visit, Will remembered the idea of performing in a Laundromat being discussed with Shrimper founder Dennis Callaci, Allen’s older brother and bandmate. We found ourselves in Claremont, California, a bunch of guys with acoustic guitars, playing an impromptu show to an unsuspecting audience preoccupied with getting their clothes clean. Allen and Dennis, a stripped down version of their band Refrigerator, were playing “State Trooper,” a Bruce Springsteen song. Allen was belting it out. When Dennis joined in on the chorus it seemed to get more intense. With each cry of “Mr. State Trooper,” their volume made me more anxious thinking the Laundromat concert would erupt into an incident of disturbing the peace. It turned into a memory and an example DIY ingenuity. When faced with no concert venue, you create one. After getting in touch with Allen through Facebook, there were inklings of the book he’d been working on. The story had me squeamish. It was tough to imagine Allen’s health struggle. He told me how insane his experience had been. At first no one could figure it out. Allen felt sick, left work and then blacked out at home. At urgent care he was diagnosed with a bad appendix, sent to a hospital where a new diagnosis of a blood sugar issue was made. As he was being released he blacked out again. Allen admitted he picked the right time and place to pass out. He ended up in Cedars-Sinai Medical Center in Los Angeles or as he called it, ER to the stars. He praised the hospital as the only one in the world that could help his condition and figure out what was wrong. It was discovered that Allen’s heart was operating at less than twenty percent efficiency and he had been born with an artery to his heart that never fully formed. The doctor was surprised he could be active at all. It was Allen’s brother Dennis who explained that Allen had been able to lead a normal life despite his heart’s condition, working as a Librarian, College Professor while also being a Rock and Roll Singer. Allen got a kick out of imagining his doctor’s befuddlement concerning his patient’s unlikely rock singer stature. 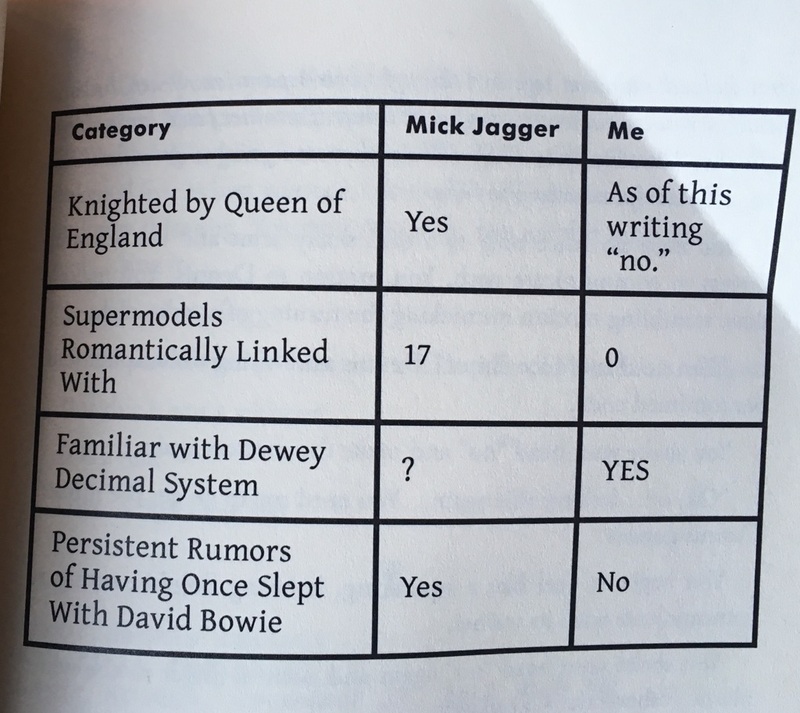 In the book he created a humorous chart comparing himself to, perhaps the most representative of all rock singers, Mick Jagger. Allen spent six weeks in the hospital getting his new heart. This turned out to be a quick turn around as the procedure can take six months or more. His convolesence included a “bubble boy” experience where he couldn’t leave the house and had to be especially germ conscious due to his loss of an immune system. “Music is where I’ve always gone to heal,” he explained as he read a section from his book about a fisher-price cd player on loan from his nephew that he had in his hospital room. He also read descriptions from the book of his performances of the song “Lonesome Surprise” with John Darnielle of the Mountain Goats calling him from a concert stage in San Francisco so he could phone his part in while recovering from surgery. 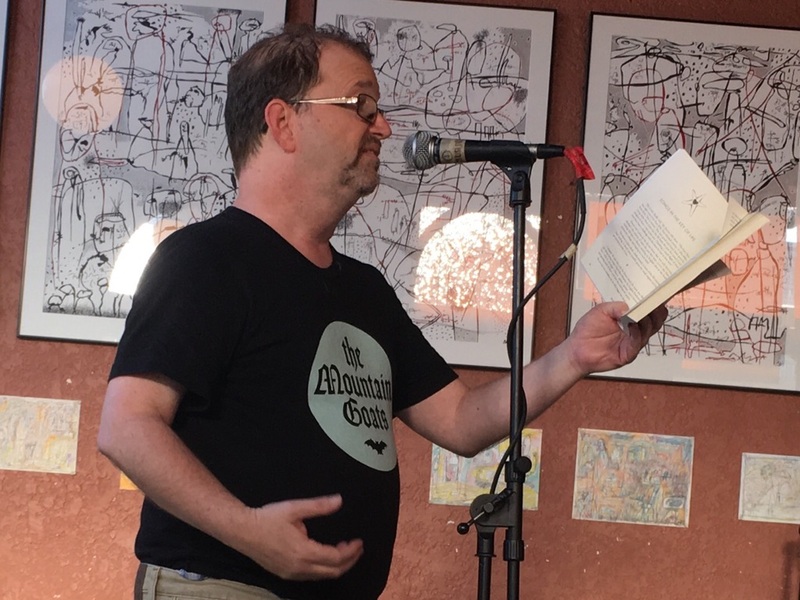 This was a reprise of a performance Allen had done of the same song years before during an international radio broadcast in the Netherlands when he had just started working as a Junior Librarian at the Upland Library. Allen proved his versatility being able to perform in a Laundromat, international radio broadcasts by phone and even after a heart transplant operation. After reading from the book, Allen sang an a cappella version of “Heart Like a Starfish,” the song he had written twenty years before about a past relationship gone wrong that became the memoir’s title. He explained that the song had come from reading Harlan Ellison who had written about how the heart could be like the body of a starfish with damaged parts growing back. There he was, that kid as I remembered him from the Laundromat, singing, pardon the pun, his new heart out, with passion, conviction and the authority of a rock singer. I no longer had to worry about him getting too loud. This was his gig. Post script: After the reading Allen sat down with old friends and discussions about medical tribulations ensued. A woman talked about her bone marrow transfusion and similar immune system challenges and Jake and I compared left elbow, bike crash scars. I didn’t want to make a low ball offer to Allen to buy the book. I didn’t have enough cash but I figured I’d get it at the library. When I looked through the online system it wasn’t there. I discovered a book suggestion form and filled it out. 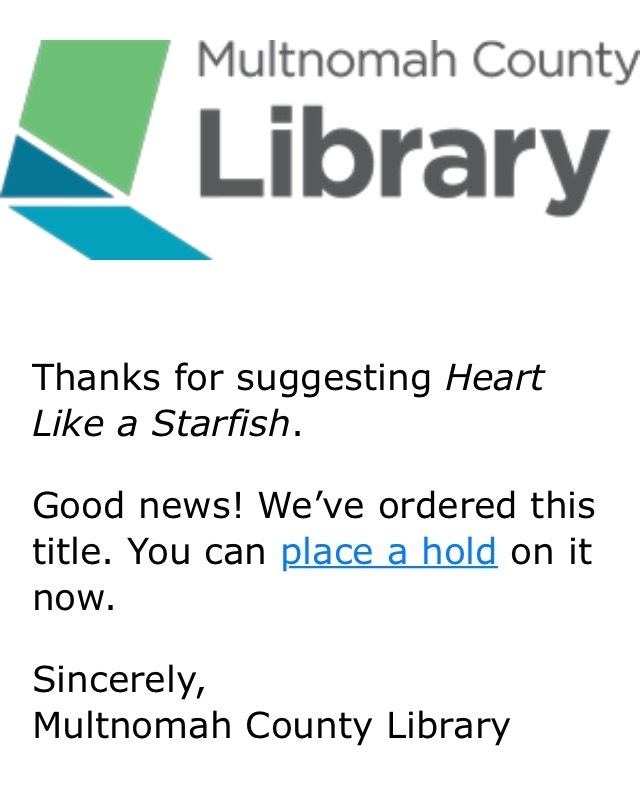 A week later, I received an email telling me the library purchased the book for their collection and that I could be the first person to put a hold on it. I’m guessing that’s the kind of thing that might fill a librarian/author’s heart with pride. One of the first things Allen mentioned was the importance of getting an echocardiogram, a sonogram of the heart, instead of an EKG or ECG, electrocardiogram test that measures the electrical activity of the heart. This starts to feel like a medical conspiracy that I’ll have to revisit in a later post but it may be worth discussing this with your Doctor. This may have been the type of information that might have helped Joe Strummer, another rock singer, who died from a heart attack caused by an undetected heart defect.